It is possible to drive to the remains of this radar station. 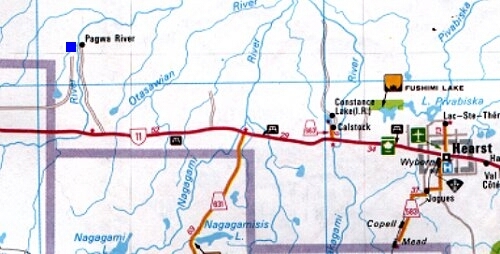 Take highway 11 west of Hearst and just a bit past the Nagagami River, make a right turn onto the Piutopiko Road. You will rach the old NTR-CNR right-of-way in six km. Turn left, and it's a straight drive right to Pagwa on the old roadbed. The Pagwa sub station disappeared in 1987 when the rails were lifted between Nakina and Calstock. Much of the right-of-way is used as a forest road.